Austin MacPhee and Jon Daly will be in charge when Hearts open their Ladbrokes Premiership campaign against Celtic on Saturday. Hearts are searching for an experienced head coach to work with current No 2 Austin MacPhee. It’s understood reports linking the club with Cambridge United manager Shaun Derry are wide of the mark. But one of the stipulations for whoever is selected to succeed the sacked Ian Cathro will be MacPhee’s retention as assistant manager. Former Dundee manager Paul Hartley is the latest to declare an interest in the post. Hearts confirmed yesterday that their under-20 coach Jon Daly has been promoted to interim head coach ahead of Saturday’s Premiership opener against Celtic. But MacPhee, who will assist Daly along with first-team coach Liam Fox, is an integral part of the club’s long-term plans. “Following on from yesterday’s announcement, the club can confirm that the recruitment process is already under way to identify and appoint a new permanent head coach,” said a Hearts statement. Hearts face further away matches against Kilmarnock, Rangers and Motherwell before they are scheduled to return to Tynecastle for the opening of the new main stand against Aberdeen on 9 September. Daly has been charged with steering the club through this tricky spell, with MacPhee, 37, working alongside him. MacPhee joined Hearts in December despite being a front-runner for the role of performance director at the Scottish Football Association. 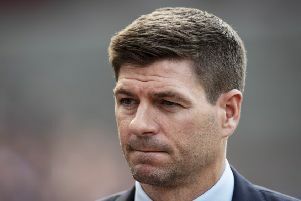 He opted for Hearts, attracted by day-to-day involvement at a club and the arrangement allowing him to continue in his role as assistant to Northern Ireland manager Michael O’Neill, who has also been linked with the Hearts post. MacPhee was instrumental in bringing several new signings this summer to Tynecastle, including Northern Irelands internationals Kyle Lafferty and Michael Smith. Northern Ireland centre-half Aaron Hughes also re-signed for the club in May after arriving during the January window. MacPhee has impressed the Hearts hierarchy since teaming up with Cathro, who paid the price for poor results when he was relieved of his duties on Tuesday. Hartley once considered hiring MacPhee at Dundee and so would likely be happy to work with the Fifer at Hearts if he emerges as the successful candidate. The Tynecastle club are preparing to draw-up a long-list of names before sifting this down to a few preferred contenders for the job. Hartley yesterday stressed his interest in returning to the club where he enjoyed four successful years as a player. He confirmed in addition he was willing to work under current director of football Craig Levein, who was his manager at Tynecastle.